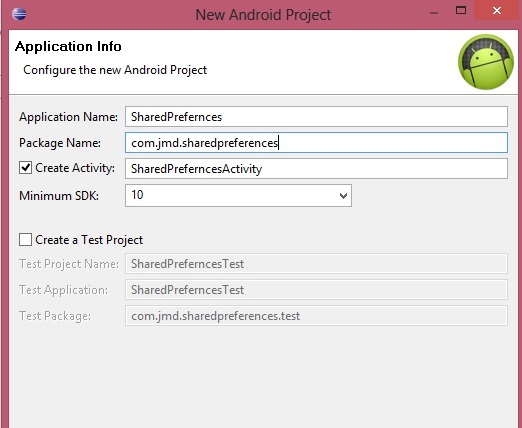 In this tutorial we are going to learn about the shared preferences feature in Android. Basically shared preference in android are used to save the state of an activity or to save the important data within the scope of an application means data will remain saved till the application is installed in the devices. 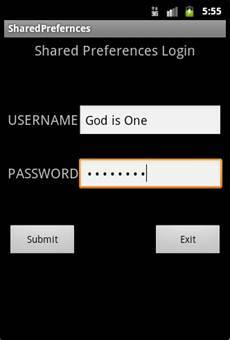 Shared Preference also works as Sessions which are used for the automatic login process. To provide knowledge to the viewer how to use shared preference in android. To give basic introduction and usage of Editor in android. 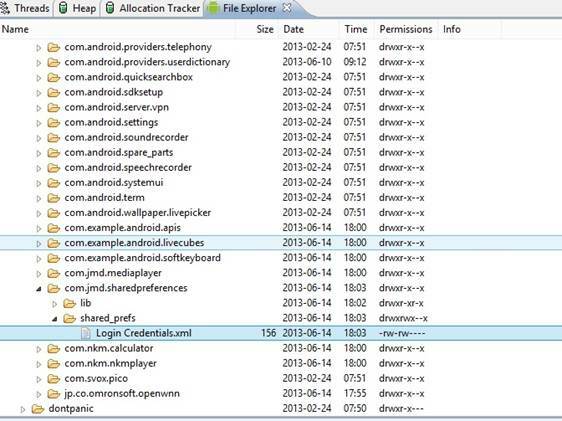 To provide knowledge to the viewer how to pull out files from Android Emulator. abstract boolean contains(String key) : This method is used to get the result in either true or false which will tell that whether ‘key’ holding SharedPreferences exits or not. It will return true it key exists. public Abstract SharedPreferences getSharedPreferences(String nm, int mode) : This method will retrieve and hold the contents of the preference file ‘nm’, returning a SharedPreference through which a developer can modify and retrieve its content values. The instance of the SharedPreference object will return only to any caller for the same name. 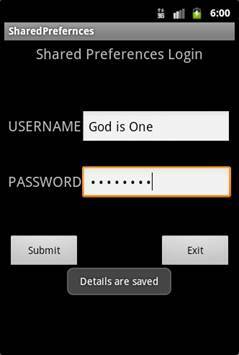 String nm : This is the user define name for accessing and modify the SharedPreferences data. int mode : This is the operating mode. 0 is default for the MODE_PRIVATE. abstract long(String key, long value) : This method is used to reterive a long value from the SharedPreferences. abstract void apply() : By calling this method, data will be modified permanently. abstract boolean commit() : This method return true if changes have made and reflect changes on call. abstract SharedPreferences.Editor clear() : This method is used to remove all values from the SharedPreferences. abstract SharedPreferences.Editor putBoolean(String key, boolean value) : This method will set the boolean value in SharedPreferences with key for the retrieval of value. abstract SharedPreferences.Editor putString(String key, String value): This method is used to put the String value in SharedPreferences and key is to retrieval of the value. abstract SharedPreferences.Editor remove(String key) : This method is used to remove the value that is holding the key. 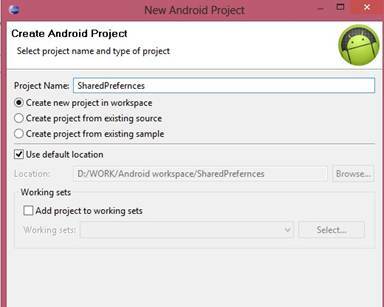 Create a new Android Project and name it “SharedPrefernces”. Give package name to it “com.jmd.sharedpreferences”. Listing 1 : Paste the following code inside the main.xml file which will create the UI Portion. Listing 2: Paste the following code inside the SharedPreferncesActivity.java file. It contains all the code and events. Figure 5 : Showing DDMS panel. Figure 7 : Shows DDMS Position. Pull the file from the device and save it to the desired location then open this file in any text editor(notepad etc) then you will able see your data that you have saved. getInit() method : This method is user defined method for the fetching of id’s from xml file. sharedPrefernces() method() : This method is used to create the shared preferences and to write the contents in it by Editor. onClick(View currentButton) method : This is overridden method which is used to perform action when user click on the submit button and exit button. In this method when user click on the submit button then sharedPrefernces() method will be called which will create a new file named as “Login Credentials” and write the data inside it by take from username and password fields. How to use Editor to write data in Shared Preferences. How to get file from an emulator.